Whether or not Hillary Clinton becomes the next president of the United States (but fingers crossed she does), one thing's for sure: Clinton's already left an inspiring legacy. Simply by being a serious contender for the highest office in the country, she's proven that women are capable of leading and leading well. 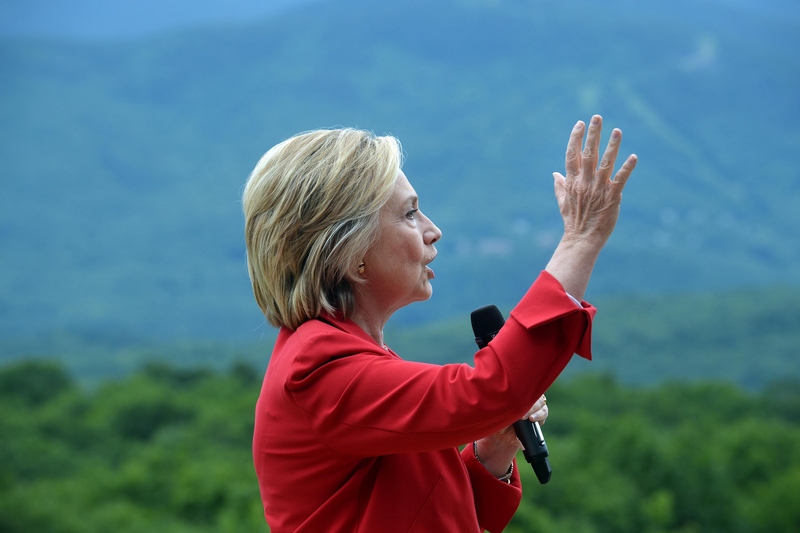 Her inspiring example is already being used to persuade more women to run for political office — a nationwide campaign called "Follow Hillary's Lead" wants to get more Democratic women on the ballot in 2016. The campaign's website reads: "2016 isn’t just the year of one woman — let’s make it the year of many women!" Launched by Emerge America, a training program for Democratic women running for office, the Follow Hillary's Lead campaign hopes to use the momentum of Clinton's campaign to increase the number of women candidates next year by 20 percent. It's specifically focusing on law enforcement positions like district attorney, which usually go unopposed. According to the Women Donors Network, 71 percent of elected officials in the U.S. are men. Even fewer women hold elected prosecutor positions — just 17 percent, while 79 percent are held by white men. It's time to put more women (including women of color) on the ballot and in office, and not just the Oval Office. Prosecutors make decisions that impact women's lives every single day, from domestic violence, to abortion rights to child abuse, and beyond. Women should be at the table making these decisions. Clinton's presidential campaign is a historic moment for women in politics, even if she doesn't win. She's proven that it's possible for a woman to have an influential political career and has helped change the archaic public perception that the president should be a man. She wasn't satisfied just being First Lady, or even a U.S. senator or Secretary of State — she kept going one step further. Her story is already inspiring organizations and women across the nation to change the disproportionate gender ratio of elected positions in 2016. No matter who's elected president in 2016, Clinton's legacy will continue to empower women and girls to make their voices heard and fight their way into male-dominated fields just like she has. Politics is still very gender biased, but Clinton's campaign is helping change that and will continue to do so for the next 16 months, if not much, much longer.